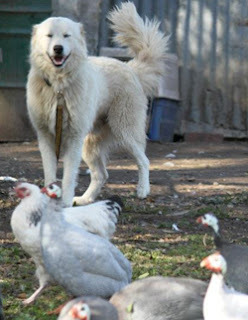 Rescue Maremma come to us through the pound & shelter system, as well as directly from owners. Some shelter dogs have been strays, others have been surrendered. Some have been displaced during a relationship break up, owners move somewhere they canï¿½t keep a dog, and occasionally an owner may have passed away. The majority of Maremma who come into Rescue were originally bought from pet shops, & knowingly sold into suburban homes. These dogs usually find themselves in Rescue because they have grown too big, shed too much hair, have become too protective, or bark too much for the suburban home. We are continually being told by owners that their cute white puppy has grown into a dog they did not expect to have and now can't keep. Where ever our Rescues have come from, they are usually lovely dogs who adapt extremely well to a new family & environment, providing the new owner understands the breed and has the time to help the dog make the transition. The ideal home for most of our rescue dogs, is small acreage, where the dog can be a general farm/family companion & guardian. Maremma puppies are unusual, very, very gorgeous & become victims of impulse buys when they are displayed in pet shop windows. Breed information is not usually supplied to unsuspecting buyers who think they have just bought a cute white puppy. The Maremma is a livestock guardian dog, very different to any ordinary dog, and needs a different upbringing from that of other pet dogs. Puppies raised in suburban homes are not usually successful, unless the owner is equipped with the right information from the outset. While there may be absolutely nothing wrong with the dog, he is genetically unsuited to an urban environment. People wanting to keep a Maremma in a suburban home, must have the time to raise & socialize the puppy according to the needs of the breed. Before considering taking on a Maremma, please do some research on the internet to get a good understanding of what the breed is all about. Click here for an excellent online site about maremmas and read more in this site through the side links.